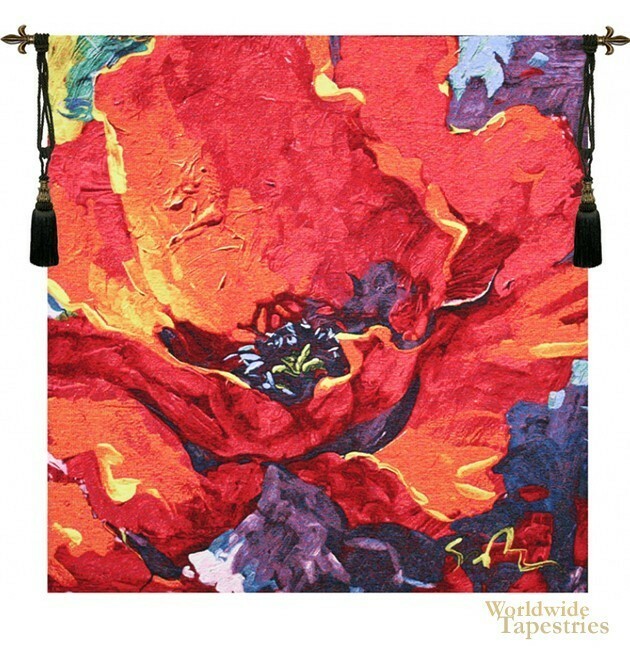 Bursting with glorious energy, this Desiree II - Simon Bull tapestry shows the poppy, based on the art of Simon Bull. Here in this exceptionally beautiful tapestry, the shades and colors of the poppy portrayed beautifully, with even the thickness of paint portrayed in the tapestry with shade and light. Simon Bull's art is renowned for its artistry, immediate impact on the viewer, and as such, has been recognised as a well praised artist throughout the world, and in the media and art critic circles. Here the red poppy petals accompany the blue, purple, cyan, pink and yellow paint like background perfectly. A study of beauty of composition and color, as is all of Simon Bull's works, is the theme of this tapestry in modern art floral style. The red poppy is a feature in other Bull's works such as Desiree, Gem, Two Poppies, Bright New Day, From This Day On, and Awakening. This modern floral tapestry Desiree II - Simon Bull, is backed with a lining and a tunnel for easy hanging. Note: tapestry rods and tassels, where pictured, are not included in the price. Dimensions: W 36" x H 36"